Unless Im mistaken, answers to questions appear in reverse chronological order, with newer answers being first in the list. Ive always felt that the accepted answer should be listed first and then descending by the highest number of votes. Isnt the purpose to find the answer, or best possible answers? If I was a new person Googling a problem and came across this site, as it had my question, I wouldnt want to sift through a variety of answers, which can range from wrong to poor. I would expect the best answers at the top. 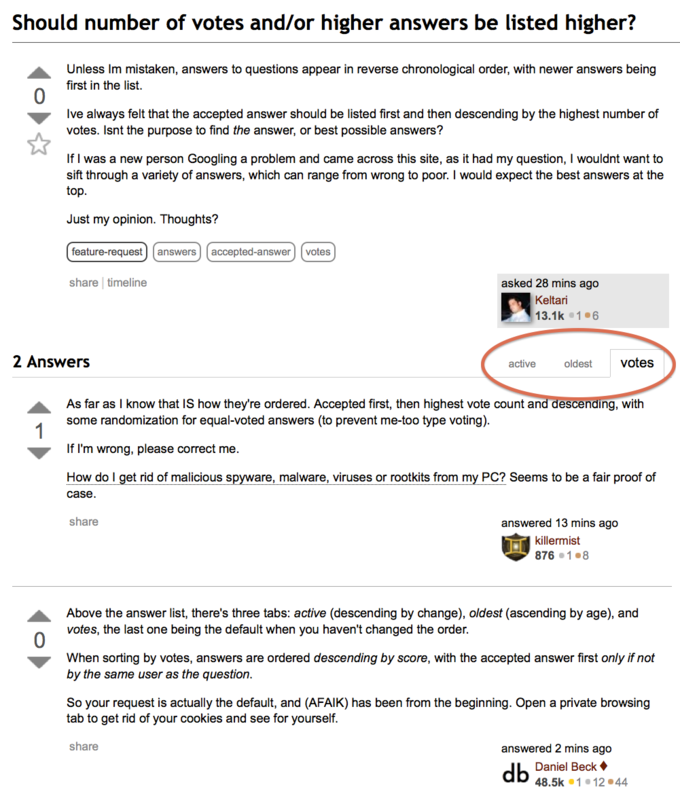 Above the answer list, there's three tabs: active (descending by change), oldest (ascending by age), and votes, the last one being the default when you haven't changed the order. In all of these sort modes, the accepted answer is first only if not by the same user as the question. So your request is actually the default, and (AFAIK) has been from the beginning. Open a private browsing tab to get rid of your cookies and see for yourself. As far as I know that IS how they're ordered. Accepted first, then highest vote count and descending, with some randomization for equal-voted answers (to prevent me-too type voting). How can I remove malicious spyware, malware, adware, viruses, trojans or rootkits from my PC? Seems to be a fair proof of case. Not the answer you're looking for? Browse other questions tagged support answers accepted-answer votes . Rollback says “resetting any offensive votes”, but rolls back *all* votes. Should I delete answers with no votes? I thought the accepted answer is always listed first - here it is second. Huh? Is there a “vote history” that shows every single up- and downvote including the revokes of votes?